One of India’s oldest existing tournaments Santosh Trophy finds a place in the federation calendar every year but once what was a premier tournament of national selection has lost much of its charm having condemned to being a league for states fringe players. 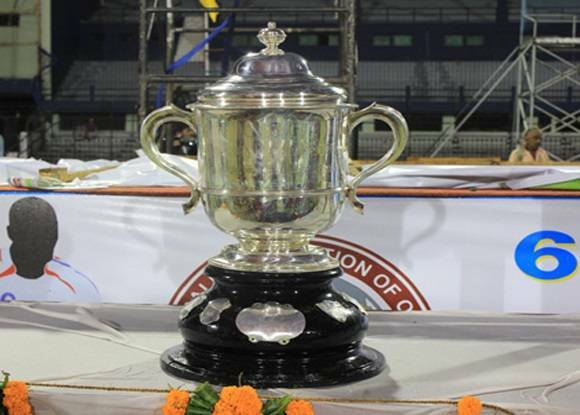 Santosh Trophy was started by The Indian Football Association way back in 1941 and named it after Maharaja of Santosh Manmatha Nath Roychowdhury who served as Present of East Bengal Club and The IFA back in the 1920′ when East Bengal won the second division of The Calcutta Football League and known for his tactful handling of several administrative crisis and administrative skills in the early days of Indian Football. Before 1996 when the National League (Presently I League) was born, Santosh Trophy was the premier inter-state championship where leading players of India turned up in their state colors to gain prominence for a national team call-up and often that would lead to securing prestigious jobs with office teams like Indian Railways, Services, Reserve Banks and many other state departments. In 1990, AIFF made a landmark ruling making Santosh Trophy a youth tournament for U-23 players but the decision was revoked after three seasons. With the start of National Football League(NFL) from 1996, top players made their allegiance clear with the respective club as Santosh Trophy’s importance started dwindling with the rise of NFL. AIFF changed NFL’ s name to I-League and give the opportunity to the huge pool of fringe and youth players made it mandatory from 2013 to make Santosh Trophy an inter-state tournament for players who are not registered on I-League. This served as a final death knell to the leagues already falling popularity as every year players from mostly second division teams and local state teams turn up for this competition to stay visible and impress the scouts of bigger teams. Bengal has been the dominant team in the tournament winning the tournament a whopping 32 times most recent being the defending champions in the last edition(2016-17) beating Goa in their own backyard. Bengal would once again fancy their chances to exert dominance in their home as 10 teams divided into 2 groups would contest for the final round of the Santosh Trophy starting 19th March in Kolkata.